Tag line: "His love was pitiful... hopeless... madness... yet "The Thing" tired of pity - and demanded love!" Directed by Karl Freund, a former cinematographer who also helmed Universal’s The Mummy in 1932, Mad Love was the film that introduced Peter Lorre to American audiences. The Vienna-born actor, who had already made a name for himself in both Germany (as a child killer in Fritz Lang’s M) and Britain (his first English-speaking part came courtesy of Alfred Hitchcock, who cast him as a terrorist in 1934’s The Man Who Knew Too Much), plays a man whose unrequited love drives him insane, a role that afforded Lorre yet another opportunity to explore a twisted, troubled individual, and, in so doing, cement his reputation as a master of horror. French surgeon Dr. Gogol (Lorre) is head-over-heels in love with actress Yvonne (Frances Drake), who he saw perform on-stage at Paris’ Theater of Horrors. Unfortunately, she’s already married to Stephen Orlac (Colin Clive) a brilliant English pianist. But when her husband’s hands are badly injured in a train wreck, Yvonne turns to Dr. Gogol for help, pleading with him to save her beloved. To the Orlacs’ delight, Gogol seemingly repairs Stephen’s hands, giving him hope that, perhaps one day, he’ll play the piano again. What the couple doesn’t know is Gogol didn’t actually fix Stephen’s own hands, but instead grafted on those of a killer named Rollo (Edward Brophy), a champion knife-thrower recently executed for stabbing his father in the back. Before long, Stephen realizes he’s unable to control his new hands, and is horrified when he, too, starts tossing knives at those around him. 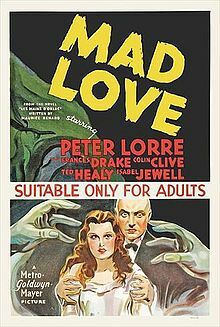 Mad Love is a very dark film. In the opening scene, we visit the Grand Guignol-style Theater of Horrors, a hauntingly peculiar place where all the doormen wear masks, and the coat-check girl doesn’t have any head at all! The hint of the macabre that highlights the Theater of Horrors sequence soon spills over into the main story, which is undeniably creepy. Colin Clive (aka Victor Frankenstein in Universal’s 1931 classic) is predictably good as Orlac, yet it’s Lorre, with his bald head and tortured soul, who commands our attention. In the movie’s most bizarre scene, Gogol attempts to convince Stephen Orlac that he’s the reincarnation of the criminal Rollo. Donning a black cloak and wearing large, metallic arms, Gogol, his voice raspy and rough, claims to be Rollo, then accuses Orlac of murdering his own step-father. The sequence then concludes with Gogol letting loose a maniacal, blood-curdling laugh. In trying to drive his adversary mad, the good doctor has himself crossed into insanity, and from the looks of it, he’s too far gone to ever return. In later years, Peter Lorre would appear in a number of Hollywood productions, covering a wide range of genres including crime thrillers (The Maltese Falcon), romantic dramas (Casablanca), even comedy (Arsenic and Old Lace). Yet, despite his occasional jaunt into the mainstream, Lorre is remembered for the sad, demented characters he would portray from time to time, and it was in pictures such as M and Mad Love that the actor truly hit his stride. A very cool looking movie. I'm definitely going to track this one down! I agree. That was a truly bizarre scene when he dresses up as the dead Rollo. It was reminiscent of Claude Rains in The Invisible Man (1933). I wonder if there would be a market today for a Theater of Horrors.